As many forklift supervisors and drivers know, OSHA can make unexpected visits to any workplace in the United States to inspect working conditions, safety hazards, and more. If they find anything wrong, the fines can be heavy. 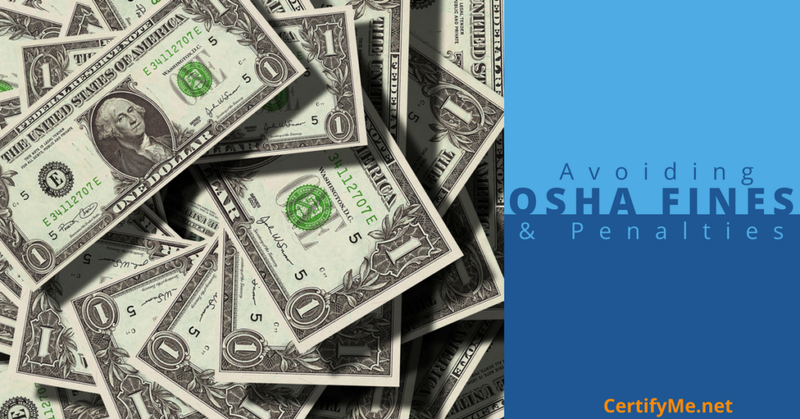 Starting January 2017, OSHA increased their penalties to accommodate inflation and to more effectively discourage sloppy work practices that reduce safety. As of this time in 2018, OSHA’s penalty for serious violations is $12, 934 and the maximum penalty for willful or repeated violations is $129,336, increasing a whopping 78+ percent since 1990. Storage racks are commonplace in warehouses across the world and are used every day to store goods and products. Storage racks are usually made of steel and are often used to support heavy loads which can cause the racks to collapse when loads are stored improperly. Forklifts are typically used to lift and lower the heavy loads and pallets that rest on these storage racks. A few years ago in Canada, Ontario’s Ministry of Labor went to investigate a number of workplaces for one month and ended up finding 3,063 violations. As reported by Maintenance, Repair and Operations Magazine, the inspection was very informative of the work environments and all of the areas where safety had been compromised. The Ministry of Labor conducted 1,167 visits to 977 workplaces over one month and issued 118 stop work orders due to unsafe conditions. The inspectors looked for the proper installation of racking and storage systems, the condition, maintenance and repair of racking systems, the condition of forklifts and whether or not they were being operated correctly and loads handled safely, whether or not the correct type of forklifts were being used in the workplace, and the presence of aisle obstructions, lighting and proper pallet conditions. While the 3,063 total violations found served as a wake up call to how workplaces could be safer, they hit employers’ bank accounts hard. It cost them each of them thousands of dollars in fines. The expenses incurred didn’t even include the changes employers then had to make to their workplaces to bring them up to code. In order to be compliant with the latest OSHA guidelines, a list was presented with various “safety systems” – methods and techniques to ensure that, if OSHA stops by your warehouse (or dockyard, loading area and other workplace that uses forklifts), you can pass the test and prevent costly citations. Offer fall protection – Companies should ensure employees are tethered with belts, harnesses, and lanyards. Plus, having regular equipment inspections (including aerial lifts) will pass even the most detailed OSHA inspectors. Empower employees – Encourage employees to speak up without fear of retaliation about potential safety hazards and concerns they come across. Ensure HazCom compliance – with many dangerous chemicals in the workplace, exposure is a common cause of worker injuries and fatalities. If a company cannot provide proper training for HazCom matters, an effective solution is hiring an outside expert for training and support. Embrace technology – Stay on top of current regulations and inspections by taking advantage of new technology. Mobile tech can reduce wasted dollars and time spent on outdated processes. Check machine guarding practices – If a forklift (or other industrial machinery) isn’t properly locked or tagged out, serious injuries can occur. Improper lockout or tagging out is a common cause of lost work time. OSHA says that a proper tag out process prevents 120 fatalities and 50,000 injuries annually. Wear proper Personal Protective Equipment (PPE) – this includes gloves, goggles, hard hats, and brightly colored shirts. This issue is covered with CertifyMe.net’s forklift training courses. And the most important: make sure all employees have completed their forklift training and have received their certification. CertifyMe.net can make your workplace achieve A+ grades for an OSHA inspection, as far as proper forklift operation and maintenance is concerned. If your workers need to get initial certification or re-certify, we have convenient online tests for your entire workforce. Because OSHA fines can exceed $100,000 for the most serious violations, this is critical. In only about one hour from any device with an internet connection, operators can complete their OSHA-compliant training and print their certification card. For more information about OSHA inspections and to make sure you’re ready for those surprise visits, you can reach CertifyMe.net at (888) 699-4800, or visit our contact page.